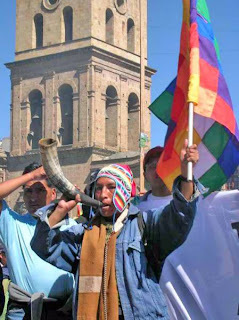 Franz Chávez, La Paz, Jan 8 , 2010 (IPS) - Just five years ago, an alliance between an indigenous leader and Bolivia's small but influential middle class seemed virtually impossible. In upper middle-class circles in Bolivia, it is fashionable to be vehemently anti-Morales. Nevertheless, the president took 64 percent of the vote in the Dec. 6 elections, compared to just under 54 percent in December 2005 - in a country where leaders are often elected with less than half that level of support. In Bolivia, where over 60 percent of the population of 9.7 million are Amerindians, the lighter-skinned middle class, made up of business families, doctors, lawyers, engineers and other professionals, have often played a key political role in the country's history. That was the case, for example, during the so-called "gas war" of October 2003 - a month of protests against the government of Gonzalo Sánchez de Lozada's (1993-1997 and 2002-2003) plans for foreign oil companies to export huge quantities of Bolivia's natural gas to the United States and Mexico. It was not just the strikes and roadblocks by indigenous and labour groups in El Alto, a vast working-class suburb of La Paz, but the presence of middle-class demonstrators on the streets of upscale neighbourhoods in the capital as well, that finally toppled Sánchez de Lozada - but not until some 60 people had been killed when the army was called out to squelch the protests. The same holds true today. While Morales' support base is made up of the urban working class and poor coca farmers and other peasants, his cabinet is comprised of a large portion of ministers from the middle class. In his reelection campaign, the president - whose second term starts on Jan. 22 - focused this time around on wooing middle-class voters, by incorporating personalities like Ana María Romero on his party's list of candidates for Congress. Romero, a former ombudsperson with a middle-class - as opposed to rural or labour - background, is first senator for La Paz and will possibly become Senate president. In 2003, Romero headed peaceful demonstrations in residential neighbourhoods against the Sánchez de Lozada administration's bloody repression of protests. Just three of Morales' 20 ministers are indigenous people: Foreign Minister David Choquehuanca, Justice Minister Celima Torrico, and Minister of Rural Development and Land Julia Ramos, all of whom come from poor peasant families. Besides García Linera, MAS leaders include intellectuals with a background in the Communist Party, whose influence waned when it flirted with the insurgent movement led by legendary Cuban-Argentine guerrilla leader Ernesto Ché Guevara - before he was captured and killed in Bolivia in 1967 - and after its brief interlude in government as part of the centre-left Popular and Democratic Unity (UDP) coalition, which governed from October 1982 to August 1985. In last month's elections, the governing MAS won 114 of 166 seats in Congress - a large enough majority to enable the Morales administration to push through far-reaching reforms needed to fully implement the new constitution, which was approved by voters in a January 2009 referendum and went into effect a month later. The new constitution empowers the impoverished indigenous majority, historically discriminated against in Bolivia, South America's poorest country. Native people were not even allowed to vote until 1952. Morales' main rival in the Dec. 6 elections was right-wing candidate Manfred Reyes Villa, who garnered 1.2 million votes, 26.4 percent of the total. Cement magnate Samuel Doria Medina, Bolivia's richest man, a centre-right politician who has sought to portray himself as a moderate, came in a distant third, with 5.6 percent (less than 300,000 votes). That leap was due to the government's successful nationwide voter registration drive, carried out with a transparent system that includes fingerprints and a photograph identifying each voter. Despite the global crisis, Bolivia boasted one of the highest growth rates in Latin America in 2009, with GDP growth of three percent, according to the Economic Commission for Latin America and the Caribbean (ECLAC), and 2.8 percent according to the International Monetary Fund (IMF), which praised the Morales administration's balanced management of public finances. The report also points to Morales' reversal of the privatisation of the country's natural gas reserves - the second-largest in the region, after Venezuela's - by an earlier administration, a move that boosted government revenues from hydrocarbons from 5.6 percent of GDP in 2004 to 25.7 percent in late 2008. In addition, Bolivia's foreign reserves climbed from less than two billion dollars in 2005 to more than eight billion in 2008, the CEPR study underlines. By July 2009, Bolivia's banks had earned a record 148 million dollars, according to the Central Bank, outstripping forecasts. Although other sectors of the economy have complained about a lack of incentives for their economic activities, the country's banks, based in the relatively prosperous eastern province of Santa Cruz, with interests in industry and large-scale production of soy, cotton and other commodities for which international demand is high, have particularly prospered under the Morales administration. And while some analysts say drug production and trafficking have grown substantially, with an estimated 100 million dollars in purchases of coca leaves and services, that figure pales in comparison to the country's 19 billion dollars in GDP for 2009 or the total bank deposits. Another sign of growth is the 23 percent increase in tax revenues, which rose from 1.86 billion dollars in 2008 to 2.28 billion in 2009, as Bolivia's national tax service reported in December. God bless you, Bolivia and Evo Morales (and not the 'god's' of the NWO (Lucifer, Moloch, Yah-Bul-On, Mammon etc). Christian or not, Evo, you are doing God's work, supporting your people; oddly enough, though it may be news to Bliar, Bush, Obomba et al, God did not endow the planet with commodities and agricultural potential for the benefits of Monsanto, ITT, Chiquitta, Dole etc. Bravo! And may an enlightened Middle Class support your efforts. As for the Vatican, I will happily debate them re the true meaning of Christ's message; but I won't hold my breath for their acceptance of this thrown down gauntlet. !A Luta Continua! (as our Portuguese brethran would say). Hoorah for Evo and MAS..your work has brought light into a despondent world. Would you folks consider applying for the title of..
'official model of development for the world'. You have no idea how you have given myself and I am sure millions of others hope in these dreadful times.